Art Deco Stencil Designs offer beautiful clean patterns of a unique classic decorative style. This Art Deco Rose will help you create some wonderful Stencil Art. 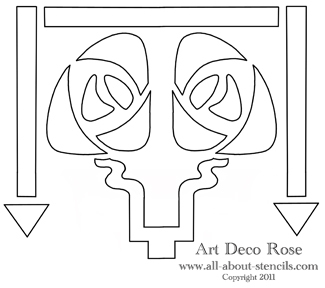 Here is a beautiful Art Deco Rose Stencil for you to use in any of your personal arts and crafts. It is one of our many Free Stencil Patterns that I hope you enjoy working with. Art Deco is an eclectic artistic design style which had its origins in Paris during 1920‘s and continued to be popular until World War II. Art Deco affected all areas of design and style such as fashion, interior design and architecture (such as the Chrysler Building in New York City). It was considered elegant, glamorous, functional and modern. Art Deco diverted attention from the soft pastels and organic forms of the Art Nouveau Stencil. Its popularity peaked in Europe during the 1920‘s and continued strongly in the United States through the 1930s. Although many design movements have political or philosophical roots or intentions, Art Deco was purely decorative. Hey! Don’t forget that I (and everyone else) want to see what you have done with your Art Deco Stencil. Just click on Stenciling Projects to get your masterpiece showcased here on this web site. Won’t that be exciting! Or if you have any questions or want to share information join in on the Stencil Blog. Well, I hope to hear from you soon. P.S. We are thrilled to introduce our selection of Downloadable Stencil Designs. Instant gratification at its finest! You don't need a special printer - these designs are specially formatted to print from your home computer on standard letter sized paper. Once downloaded, you will have your complete stencil booklet with patterns and instructions. Just click, buy and print! Return to Home Page from Art Deco Stencil. Return to Stencil Designs from Art Deco Stencil.